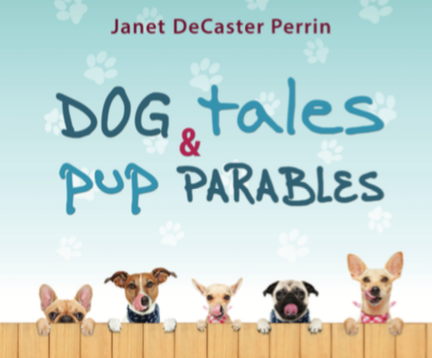 As a dog lover, I was more than interested to receive a copy of ‘Dog Tales and Pup Parables,’ a book written recently by a friend of ours Janet DeCaster Perrin. ‘Dog Tales and Pup Parables’ is a series of 31 devotionals for a dog lovers heart. Each devotional begins with a story from the life of one of Janet’s dogs, or in some cases other people’s dogs. These stories become parables, as they convey God’s truth and God’s word to the reader. Janet then concludes each story with: a personal prayer; some focus verses and prayers of faith; and a devotional with thoughts for personal journaling. A trail of socks went up our stairs. Exasperated, I knew that Joy, our Bichon-Cavalier mix (Camacho) puppy, then probably less than a year old, had stolen more of our socks. She had a real penchant for chewing on socks and raiding the bathroom garbage cans. I always knew when someone hadn’t thrown their laundry in the basket. I’d find a sock in some strange place or catch Joy in the act with a sock in her mouth. It was frustrating because we lost a lot of good socks that way. On Mondays, the church where I worked part time as a staff pastor was closed. It was the perfect day to clean the house and get our household organized for the week while the kids were at school. I am a multitasking mom. While I cleaned the house and performed other mundane tasks, I prayed. I was also thinking about the sermon I was going to share at our Sunday night church service later that week on the love of God. As I prayed and cleaned the house, once again, I caught Joy with one of my favorite bright pink thermal socks in her mouth. When you live in Minnesota, you learn to value thermal socks during the long, cold winters. As I came up the stairs and saw Joy happily chewing on my beloved sock, I was mad at her. She ran and hid under our bed. She was so small. I had no way to get her or the sock out because she hid just beyond my reach. In the midst of my consternation with Joy, the Holy Spirit broke through my thoughts and spoke in the quiet of my heart. He simply said, ‘I love you in spite of your sock problems.’ The still, small voice of the Holy Spirit brought His sweet peace into my heart. God was telling me He loves me even when I don’t measure up or I fail Him in some way! He loves me, just as I loved our little dog. You see, even though I sometimes found Joy’s sock-stealing ways inconvenient, I always loved her. She made me laugh and smile and also laugh at myself. She was a source of joy to my kids and myself. When any of us felt blue, Joy, a born-and-bred lap dog, would come sit with us and everything would be okay. When we were petting Joy, we’d feel much better. When the Holy Spirit whispered His love for me, despite my sock problems, I knew exactly what He meant. I knew He loved me and that I made Him smile, despite the fact that I sometimes messed up. His words deeply impressed in me that His love for me was unconditional. In other words, His love didn’t depend upon my performance. This fresh revelation of His love gave me the perfect sermon illustration! I ran to get my camera and took a photo of Joy with my bright pink thermal sock in her mouth. My day of prayer and housecleaning brightened immeasurably, and I had peace about my sermon message that week. That Sunday evening, I displayed the photo on the screens in the church sanctuary when I was teaching. Janet has served as a Pastor to women in a local church, a Bible college adjunct faculty member, a missions team member, a Deacon, a committed volunteer and is the mother of two. She is ordained as a Christian minister. She has authored two books available from Broadstreet Publishing and Amazon. 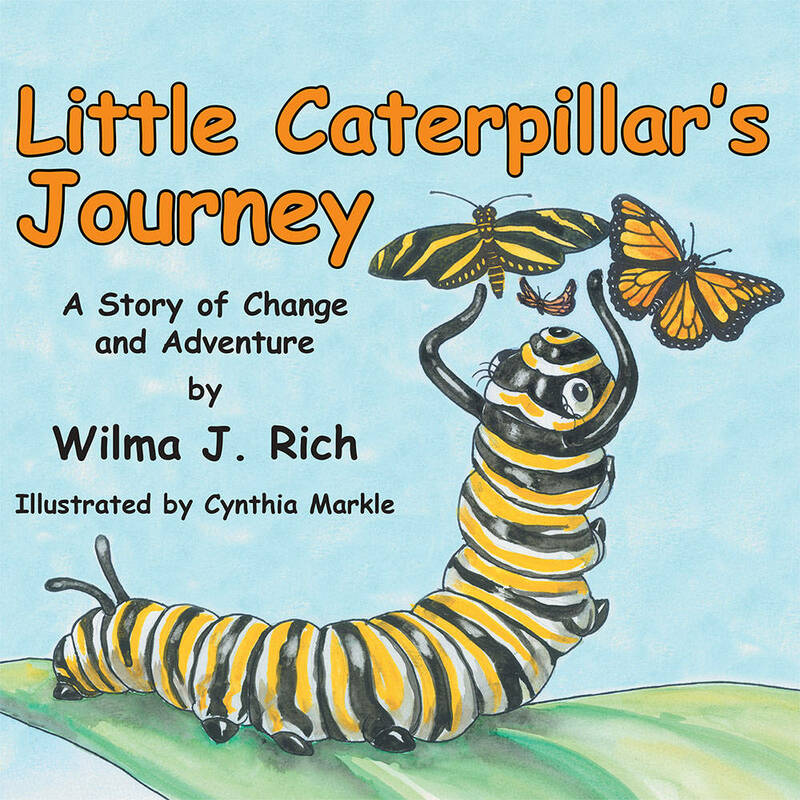 The book concludes with ‘Lessons from Little Caterpillar,’ along with information about the study of Monarch butterflies, who in recent times have been in trouble. Wilma Rich is a retired biology teacher with a Master’s Degree in Zoology, who loves the Lord and His creation. She has been married for over fifty years and is the mother of two married children and grandmother of seventeen wonderful grandchildren. This delightful, children’s book would make a great Christmas gift. Click here for more information on this book or to order it.